What should we do with the barn cat when moving? Horses=Barn=Cat…at least it did for us. 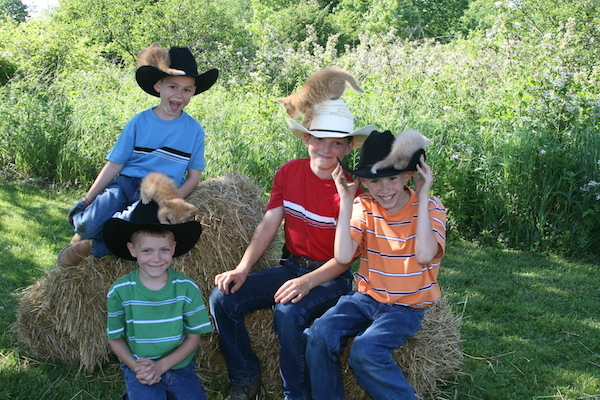 Westfall boys and a friend with the barn kittens. While planning our move, one of the big questions has been; what do we do with the barn cat? What would be best for her? Do we leave the cat with the house? It is where she was born…where she has always lived…is that what she would want? Or is taking her with us an option? How often will we move? Will constant moving increase her odds of running away or getting lost? Or is there someone we would trust? Someone who would want her and care for her…maybe someone who could make her a house cat? And then all of the pieces began to fit together. 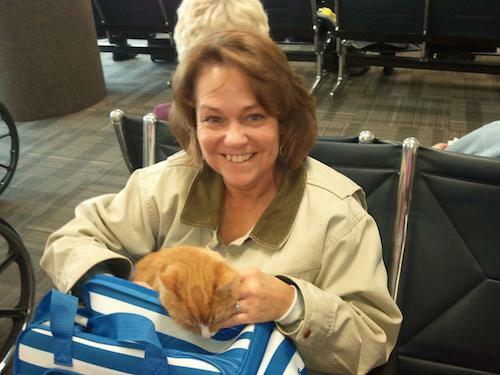 It started as a joke, mom flying home with a cat, lol, I’ve never seen a cat on an airplane. Can you fly a cat? Mom called to find out. Yes, you can fly with a cat as a carry on for $125 as long as they can fit in a carrier under the seat in front of you. But only six pets are allowed per flight and mom’s airline wouldn’t sell a ticket before the day of the flight because she didn’t book it when buying her tickets. This left us wondering…what happens if you arrive carrying your cat and…there is a cat convention and all the spots are sold? I guess we will be driving around the airport until we know! But is Maine the best place? Don’t get me wrong, I totally trust my mom, but how will the cat adjust? Would she be happier staying here? One more call to the new home owners gave us the answer; they would allow the cat to stay but they weren’t really cat people. Our cat is a people cat. This won’t work. I was soooo glad they were honest, much better than an unhappy cat. Who knew Martha Stewart had the perfect airline sized carrier? The trip to the vet gave us a test ride in the cat carrier which includes a tether strap…probably for those pesky feline bullets that shoot out when opening the door. Not our cat, she just peeked out. 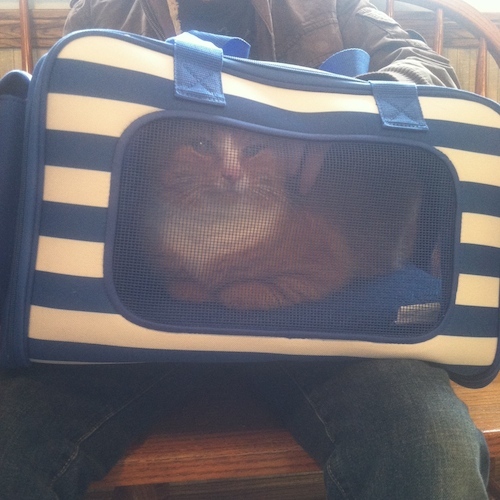 Now we had a cat carrier, health papers, practice in the carrier, a prescription to relax the cat….but no ticket. The worst part was probably the drive to the airport this morning and the suspense of wondering if the cat would be allowed to fly. The cat was looking even more calm than normal thanks to half of the little pill the vet had given us. I joked that maybe mom should take the other half, not knowing if the cat would be allowed was haunting her. But they did. Mom had to take her out of the crate and carry her through the scanner. No problem. All the training the boys had done had paid off. Today our cat, who had never been further than the vets office from our house, headed to the airport in Ohio, had a layover in Pennsylvania, and arrived safely in Maine. Mom, or Nene as the boys call her, even thought to take old PJ’s that smell like the boys…which the cat is now sleeping on. Now that’s a cat person! The barn cat who flew from Ohio, to PA, to Maine! 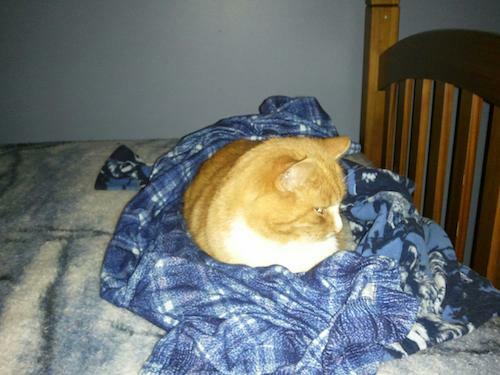 Cat in new place sleeping on old PJ’s that smell like the boys…. ← How much weight should a horse trailer haul? This was a wonderful, loving solution for your cat, Stacy. Thanks for sharing the story with us. Stacy, your Mom must have had you at about age 10 ! Lovely lady! We moved from Ohio to Tennessee with 3 barn cats, 1 house cat, 2 outside dogs, 3 in side dogs, and 20 horses. We hauled our cats and dogs in our horse trailer and hired semis to deliver our horses. We now have 8 cats, 8 dogs and 22 horses. I now love you even more than I did before. Thank you for sharing. I don’t even believe you. NOBODY I know has one barn cat. Usually the number is approximately the same as the numbers of stars in the sky! My dairy farmer friend Jans said “my barn cats don’t have problems; they ARE the problem” Funny quote. The FUNNIEST part of flying my one barn cat to Maine might be that THREE strays have shown up! One showed up before but now there are two more! How do they know? Where do they come from! Oh great! Kitty gets to have visits from her boys too. Moms are awesome. Stacy you guys think of everything and remind me that there are priorities in life worth making and working towards. What a great experience for your boys to see that, our animals, all of them- big and small are our responsibilities . and god always finds a way when we take care of his creatures. What good examples you and Jesse are to those lucky boys. So glad it work out. Any other animals you need help with? Maybe I can help. I think that is part of Nene’s plan, lol. The kids are already asking to visit the Rolie Polie! What a great story. I remember your cat so well. It’s great that he could stay within the family. Stacy at least you had the good sense to think it through. When I bought my farm I discovered I had inherited two barn cats. Both had been born and raised on the farm but I was still very annoyed as I am NOT a cat person. Lucky for me/them, one of them was a silly clown and won me over before the trip to the cat shelter happened and they both lived another 13 years with me before passing away a couple of years ago. I miss them both. Now, I have another, and difficult or not, when I go, she goes with me. Wonderful story! Now your mom can have a piece of all of you with her at all times! I worried about my cats when moving recently. I stressed out for months and everyone thought I should put them in separate trucks for the trip. I kept them with me in the back seat, each in a separate cage, thinking, “Why should others go through the problem of long distance travel with cats? I had to do it for one, I might as well do it for 9”, lol. But other than having an unexpected feral tom cat added at the last minute, there was no problem with the cats at all. None of the animals were sedated and they all spent between 24 and 48 hours in horse trailers and the backseat of the truck. When they arrived, all except the feral tom cat went into shock for several days. They hid in various places in the new house. They all seem fine now and back to normal, some in the house, others in the barns and a couple in various garages occasionally. But I do try to get them all in the house for the nights, just so I know where they all are, and do a head count and see that no one has had any accidents. Then they get brushed, one at a time because most have angora fur and mat quickly. Hey! I’m not a cat person! I keep horses…, the cats keep me, lolololol! Thank you Stacey and Nene, for going out of your way and considering the future of your pet. I know you call her a barn cat, and that may be where she lived, but she is obviously part of your family. So happy you didn’t decide to leave part of your family behind like many would have. And thank you from Rolly Polly for being a furrever friend!!! 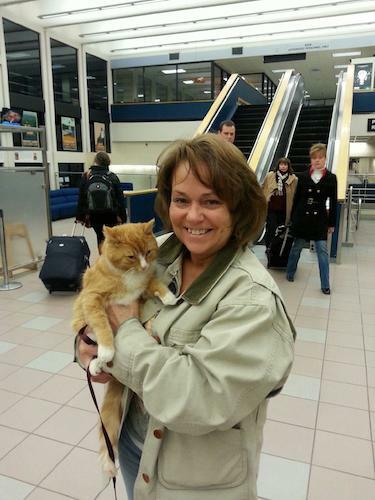 Great Mom/cat story with a happy ending. I am a horse, dog, cat person, and I think you arrived at the perfect solution. What a great story! We have a very people and Dog friendly Barn Cat where I work too Ride! Chloe is very good with my German Shepard; samantha! She even rubs her back on sam’s hind legs! So I know how attached you can get too a Barn Kitty! pickles samantha & Beaujolais 🙂 Beau is a Dutch Frisian, with a French Name? Hmmm……….? Blessings on your mom for her love and generosity. Kitty is still in the family and your boys know they will see her again! Oh, so glad you worked it out! Such a sweet solution and the cat seems relaxed on the old PJs in Maine. Thanks for sharing a responsible way of dealing with this dilemma. Your Mom is very pretty…no wonder you are so sweet, too. You are really a special and kind and smart person. Great ending Stacy. So happy for your Mom and your and your kitty! Your a great animal owner, and I am so happy to be following you! Now you just mail one set of dirty pjs each week to Kitty. Rotate which boy gives up his jammies and gets new ones. If you pack them in the right size box, Kitty gets a new bed AND a new toy! Oh, and hooray for your mom! She saved the day! I have an orange cat as well..they really are ‘people cats’! Your mom looks thrilled to get to have a little part of the family with her in Maine. Safe travels. She is soooo pretty!!!! That’s a great Nene!!!!! God bless your mom! That can take the worry out of wondering if your cat is well cared for. What a relief for you all! I understand the emotions you have when giving away a pet. It can be tough. Best of luck to your mom! I wish I had known. She could have joined our barn cat. We are cat people. Good luck and Good bless. Dawn and Bill. This is such a sweet story! Glad there was a happy ending. Thanks for sharing, just wondering does the cat have a name? What a lovely story. Hope the barn cat has a long and happy life in Maine as a domestic cat. We have 2 outdoor/barn cats that we decided to bring with us for a move from Oregon to Texas. Now they are indoor cats. We drove back to Oregon for the holiday and took them for a visit and they loved and remembered their outdoor territory. Back again to Texas where they soothe themselves by sitting in the windows. They are adaptable!